Phix Natural Energy Drink Giveaway ~ 3 Winners! Phix Energy is an herbal energy drink powder blending green tea anti-oxidants, energy-restoring NADH and yerba maté for enhanced vigor, plus we add vitamins and minerals to keep you feeling healthy. Our Phix powders are entirely natural, vegan, and gluten free. My Hubby is superman. He works and works and gets little sleep. When he is home and active with the family I know he is very tired. He will occasionally have an energy drink or most of the time soda with caffeine to give him that extra kick. I wish that we would have found Phix long ago! He adds it to his water for a pick-me-up, but leaves the crashes that most energy drinks provide behind. He is also a baseball player and loves to bring a thermos of it for his games. It comes in three delicious flavors ~ Citron, Teaberry, & Tropic. 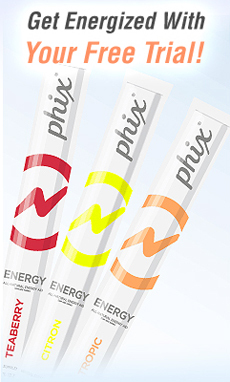 What I like about Phix it not only that it doesn’t contain the nasty ingredients, but healthy benefits too! Added vitamins and green tea extract which I was excited to see as I’ve taken a vow lately to add green tea to my daily diet. Phix also makes natural sleep aids which are sophisticated herbal supplements blending Lemon Balm, Chamomile, Gaba, Jujube Berry and Magnesium to help you let go of your daily stress and drift off to a sound and blissful sleep. I think I’m going to send my mom a pack of these as I hate the pills she takes to fall asleep. That should be a natural thing that happens in life and I hate seeing medicine having to be an aid for it. Check out Phix ~ they have a great website that highlights all the benefits and scientific research that went into making Phix. You can also read about how this company loves to be eco-friendly, which is awesome too! Free Trial! You cover the $4.99 for shipping and handling and they’ll give you $12 worth of Phix Energy for free. You’ll get 6 single servings of Phix energy powder – 2 of each of their flavors. Like on Facebook and you’ll earn a code for only $2.99! From now until the end of October, for each of your pink, Teaberry Phix purchases, we will donate $1 to Susan G. Komen for the Cure foundation. I’m not a girl who likes to push natural products on people, but deodorant is one product that I do stress the importance of switching. I found some great facts from a natural skincare site to share with you. Aluminum, the sweat blocking ingredient found in most conventional antiperspirant deodorants, is a known neurotoxin and suspected contributor to Alzheimer’s disease, chemical sensitivities, and breast cancer. Parabens also appear to be cause for concern. Scientists believe the parabens used in most deodorants and antiperspirants could be responsible for accelerating the growth of tumors in the breast. 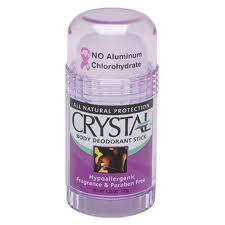 I took a trip to Walmart the other day and picked up some Crystal Deodorant. I was very happy to see this there as I thought they only carried one brand in one scent. I was wrong and excited to get to try it out! The first thing I noticed was the Pink Cancer Ribbon. This product was endorsed by the Cancer Treatment Center! Why? Because it contains No Aluminum Chlorohydrate. It is Hypoallergenic, Fragrance & Paraben Free. Crystal Body Deodorant is made of Natural Mineral Salts which prevent body odor by creating an invisible protective barrier against odor-causing bacteria. It is non-sticky, non-staining, leaves no white residue and can be used by both men and women. I was happy with the price at $3.84, but a little worried because I haven’t used a roll-on in forever! Would I like it? I do so far! It is not runny like roll-ons can get and does keep me odor free. At first I had wanted it to be in a scent, but I think I like that it is not! I am very happy to find another natural deodorant choice nearby at Walmart! Have you switched to a natural deodorant yet? I was able to review Crystal Deodorant free of charge by participating in #CBias blogger program, but all opinions are my own. I have a chance to win a gift card for writing this post.